GAITHERSBURG, Md., Sept. 2, 2010 — A new experiment proposed by physicists at the National Institute of Standards and Technology (NIST) may allow researchers to test the effects of gravity with unprecedented precision at very short distances — a scale at which exotic new details of gravity's behavior may be detectable. Of the four fundamental forces that govern interactions in the universe, gravity may be the most familiar, but ironically it is the least understood by physicists. While gravity's influence is well-documented on bodies separated by astronomical or human-scale distances, it has been largely untested at very close scales—on the order of a few millionths of a meter — where electromagnetic forces often dominate. This lack of data has sparked years of scientific debate. "There are lots of competing theories about whether gravity behaves differently at such close range," said NIST physicist Andrew Geraci, "But it's quite difficult to bring two objects that close together and still measure their motion relative to each other very precisely." Actually realizing the scheme — detailed in a new paper in Physical Review Letters — could take a few years, co-author Scott Papp says, in part because of trouble with friction, the old nemesis of short-distance gravity research. 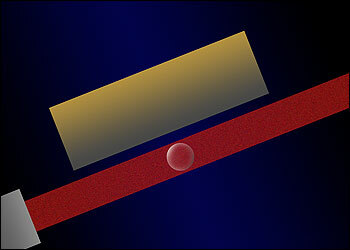 Previous experiments have placed a small object (like this experiment's glass bead) onto a spring or short stick, which have created much more friction than laser suspension would introduce, but the NIST team's idea comes with its own issues. "Everything creates some sort of friction," Geraci said. "We have to make the laser beams really quiet, for one thing, and then also eliminate all the background gas in the chamber. And there will undoubtedly be other sources of friction we have not yet considered." For now, Geraci said, the important thing is to get the idea in front of the scientific community. "Progress in the scientific community comes not just from individual experiments, but from new ideas," he said. "The recognition that this system can lead to very precise force measurements could lead to other useful experiments and instruments."